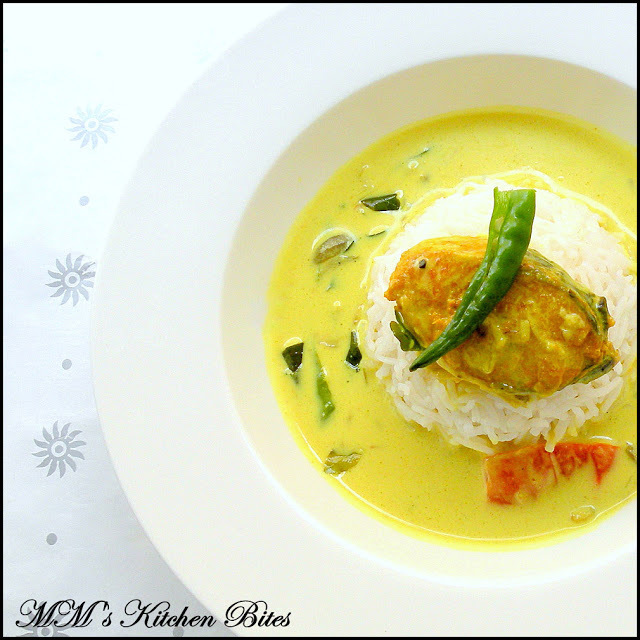 Home Black pepper Meen Molee/Fish Molee/Kerala style fish curry cooked with coconut milk …Annie’s Song!!! 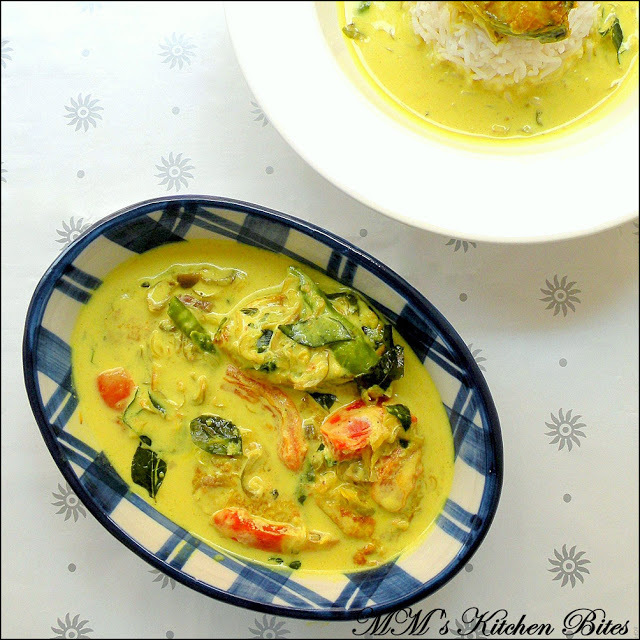 Meen Molee/Fish Molee (Kerala style fish curry cooked with coconut milk)…am not very confident making fish curries but this is one of those that I love to make since I have never messed it up J (till now)…Annie, thank you for the recipe. Wash, clean the fish and pat dry. Marinate the fish with marinade ingredients listed above for 10-15 minutes. Heat oil in a pan and lightly fry marinated fish pieces on a medium heat. Remove and keep aside. Heat the remaining oil in the same pan. Add ginger, garlic and fry for 10-15 seconds. Add in the onions, green chilies, curry leaves and sauté till onions become soft and translucent. Add in the turmeric and pepper and fry for 15-20 seconds till the raw smell of the turmeric goes away. Now add in the thin coconut milk, mix well and let it simmer for 2-3 minutes. Slide in the fried fish and tomato wedges. 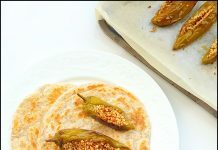 Cover and cook the fish – since the fish is already half done while frying, it only needs to be cooked for 2-3 minutes. Pour in the thick coconut milk and salt – carefully stir or just swirl the pan to mix in the coconut milk. You don’t want to break the fish or mush up the tomatoes by stirring too much. Let is cook for another couple of minutes and done! 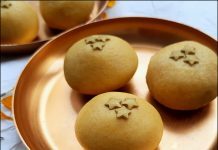 I use coconut milk powder as it is easy to adjust consistency per your requirement. If you are using canned milk, keep the can in the refrigerator for a few hours – remove and open it without shaking too much. The layer formed on top will be thick milk/cream and the layer on bottom will be thin milk. If you want to make it from fresh coconut – use grated or chopped coconut and blend it with double the amount of warm water to a smooth runny mixture. Sieve and squeeze through a muslin cloth – this is your first extract a.k.a. thick coconut milk. Blend the remaining coconut mixture with equal amount of warm water. Sieve and squeeze through a muslin cloth again – this is your second extract a.k.a. thin coconut milk. You can make coconut milk with unsweetened, dried coconut as well – same process as with fresh grated coconut. 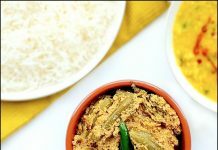 I prefer using coconut milk powder for curries because with it I have never faced the typical issue of coconut milk splitting while making the curry.The other option is not let the milk boil but only gently simmer to avoid it from splitting. Previous articleBhaja Muger Dal/ Bengali Roasted Mung (Moong) Lentils…lunch is served!! Next articleMutton Pepper Fry…real food! !